U.S. President Donald Trump will try to work with Pakistan on counter-terrorism “one more time” before taking measures forcing the nation to do more, Defense Secretary Jim Mattis told lawmakers on Oct. 3. 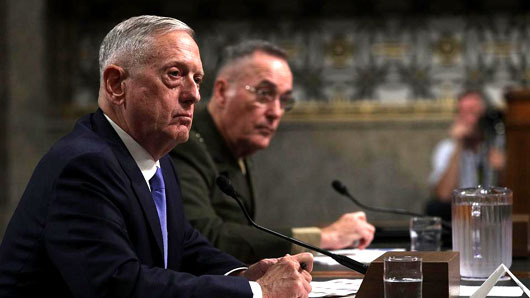 “We need to try one more time to make this strategy work with them, by, with, and through the Pakistanis, and if our best efforts fail, President Trump is prepared to take whatever steps are necessary,” Mattis said during a House Armed Services Committee hearing on the president’s strategy in the region. Trump has already withheld $50 million in 2016 outstanding military reimbursements to Pakistan because it failed to take what the administration deemed adequate action against the Taliban and its ally the Haqqani Network in Afghanistan. According to U.S. Gen. John Nicholson, the top commander of American and NATO troops, the Afghanistan-Pakistan region is home to the “highest concentration” of jihadist groups in the world – 20 of the 98 U.S. or UN-designated terrorist organizations. Mattis said he believes the Trump administration will ultimately convince Pakistan to stop serving as a safe haven for terrorist groups. “I like to think we will be successful,” he said, adding the U.S. has an “enormously powerful number of options” if not. Mattis said that stripping Pakistan of its “major non-NATO ally” status is on the table. Gen. Joseph Dunford, the chairman of the Joint Chiefs of Staff who testified alongside Mattis on Oct. 3, urged Beijing to “play a more productive role” in countering terrorism in Afghanistan, which shares a border with China.